Hong Kong Fashion Geek: Attention Carnivores! Sharpen your knives and get ready for the beef! 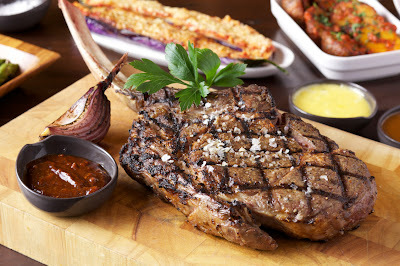 US bone-in beef is now allowed back into Hong Kong and to promote the good news, Dining Concepts and its stable of restaurants are featuring one of the finest steak cuts -- the Tomahawk. This giant slab of meat is not for the faint hearted, nor should one person even attempt to eat one on his own. From now until July 24, Bistecca Italian Steak House, Craftsteak, BLT Steak, Prime Steak House/Wine Bar, Tango and Manzo Italian Steak House are offering the Tomahawk steak as well as a choice of two side dishes for HK$998. Sides include mashed potatoes, roasted potatoes, brussels sprouts, sauteed carrots, broccoli, baby asparagus, and mac n' cheese. Needless to say this feast is good for two to three people. The beef is sourced from the US where the cattle are fed a high-energy grain-based diet and are able to graze in open pastures. To complement the meal, all the restaurants have an extensive selection of reds to complete the steak dining experience. For more information go to www.diningconcepts.com.hk and dig in!